In the midst of researching my master's thesis, I stumbled on this poem from 1914. 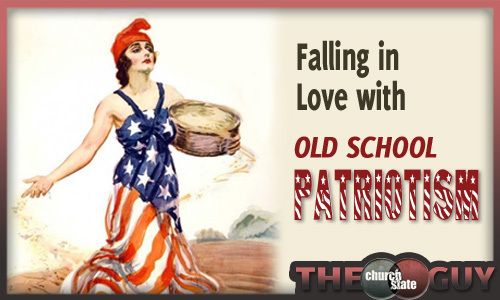 Patriotism is supposed to be noble, but nationalism and Statism have dragged it through the mud. This poem helped me remember what true Patriotism is all about. I’m working on my thesis, it’s coming down to the wire. During my research I stumbled on this poem. My thesis is on religious patriotism. I was attracted to the idea because I see a natural tension between loyalties to God and loyalties to the State. I’m not saying they are incompatible, simply that they have to be equally respected and yet clearly separated in order for each to thrive. So when I started finding some descriptions of patriotism in the early 1900’s that were filled with religious language but were still very stirring and compelling I was shocked. I mean, I would LOVE for us today to be talking about our country and neighbors in this way. Here’s the text, specifically. Some of these lines could have been plucked straight out of the Civil Rights movement. Some of these lines should sound old and mainstream by now, but somehow are still relevant and challenging. I mean: “I will enlarge my soul by love for those from whom I find myself recoiling.” Holy geez! Can any of us say that our society today is anywhere near this type of love of neighbor? If patriotism meant giving your all to your fellow human being, especially those who you currently find yourself recoiling from, then I AM ALL FOR IT. This all tells me two things: (1) We haven’t progressed enough, there’s more neighbor-loving to be done, there’s too much anti-neighbor bigotry and hate going around 100+ years ahead of this patriotism. (2) We define what patriotism is. We don’t need to throw the baby out with the bath water. We can say that being patriotic means loving your neighbor, means putting your life at risk to help rescue some young girls next door are trying to escape their captors, it means paying your taxes because taxes mean investing in your local school, airports, police force, roads, etc. Patriotism does not have to mean “U-S-A! U-S-A!” That’s actually NATIONALISM, not patriotism. Nationalism leads down dark and scary places, but patriotism leads us to our fellow man and woman. Next Next post: How I got Recursive Backups for my Thesis, free!